In a medium to large saucepan, bring heavy cream and oyster liquor to a simmer over medium-high heat. Remove from heat. Meanwhile, in a large skillet, heat butter over medium heat. Add celery and salt and sweat for 3 to 4 minutes. Add onion and continue cooking for about 4 minutes. Add celery seed, hot pepper sauce, and oysters. Cook until oyster edges start to curl, approximately 1 to 2 minutes. Transfer oysters to a blender and add enough cream to cover. Puree until smooth. Add the blended oysters to the cream mixture along with the mushrooms, if desired, and heat through. Enjoy! If you'd like a printer-friendly version of this recipe, Click Here. In a large bowl, combine turkey and next 8 ingredients, down to and including pepper. Mix well, and form 1 1/2 inch meatballs. Place meatballs on a plate. Preheat the Instant Pot by pressing "Sauté" on high heat. Once hot, add olive oil. Place the meatballs, in a single layer, in the pot. Cook for 1 minute. Add tomatoes, tomato sauce, water, and rigatoni. Carefully push the pasta down so it's submerged in the tomato mixture. Select "Manual" and cook at high pressure for 5 minutes (sealing lid). Once cooking is complete, select "Cancel" and let sit for a minute or two. Place a towel over the lid and use the quick release to let out the steam. Serve topped with more basil and parmesan if desired. Enjoy. If you'd like a printer-friendly version of this recipe, Click Here. This creamy chicken and vegetable mixture is placed on whole-grain toast for a twist on chicken pot pie. Still that same savory flavor without all the fattening crust. Heat oil in a large skillet over medium-high heat. Add mushrooms and cook until they are browned, about 4 minutes. Sprinkle flour in the pan and stir, coating mushrooms, about 1 minute. Add chicken stock and carrots and cook for about 4 minutes, until carrots become crisp tender and the stock begins to thicken. Add peas, corn, salt, pepper, and chicken; and stir until cooked through. Toast bread and top each slice with chicken pot pie mixture. Garnish with fresh parsley. Enjoy! If you'd like a printer-friendly version of this recipe, Click Here. Who wants hot soup when it's 100 degrees outside? This chilled corn soup is very refreshing and creamy, and can be topped with just about anything you'd like. I topped mine with fresh basil pesto as well as bacon and sour cream. Toppings of your choice: bacon, sour cream, pesto, corn relish, etc. Cut kernels from corncobs and place in a bowl. Using a grater, scrape pulp from corncobs into another small bowl. Discard cobs. Melt butter in a large skillet over medium-high heat. Add onion, garlic, salt, and pepper and let cook until tender, about 4 minutes, stirring often. Add water and reserved corn pulp. Bring to a boil and then reduce heat and let simmer 4 minutes. Transfer to a blender and add olive oil. Remove center piece from blender lid to allow steam to escape. Hold a towel loosely over the lid to prevent any hot liquid from splashing on you. Process until smooth. Pour mixture into a bowl, add vinegar, and stir. Cover and place in the refrigerator until chilled. Spoon into small bowls and top with your favorite toppings. Enjoy! If you'd like a printer-friendly version of this recipe, Click Here. These tuna steaks are seared to perfection without overcooking the center. Sprinkled with cracked pepper and seared in sesame oil, they have a robust flavor that keeps you coming back for more! Sprinkle cracked pepper on both sides of tuna steaks. Heat a large skillet over medium-high heat with sesame oil. Place tuna steaks in skillet and sear about 3 minutes on each side (until you have a good sear on the outside and the inside is just opaque but not too done. It should still be pink in the center.) Remove tuna to a plate and keep warm. Add soy sauce and sherry to the skillet and cook until liquid is slightly reduced (about one minute) scraping any brown bits in the skillet. Spoon sauce over tuna steaks and add fresh chives. Serve immediately and enjoy! If you'd like a printer-friendly version of this recipe, Click Here. 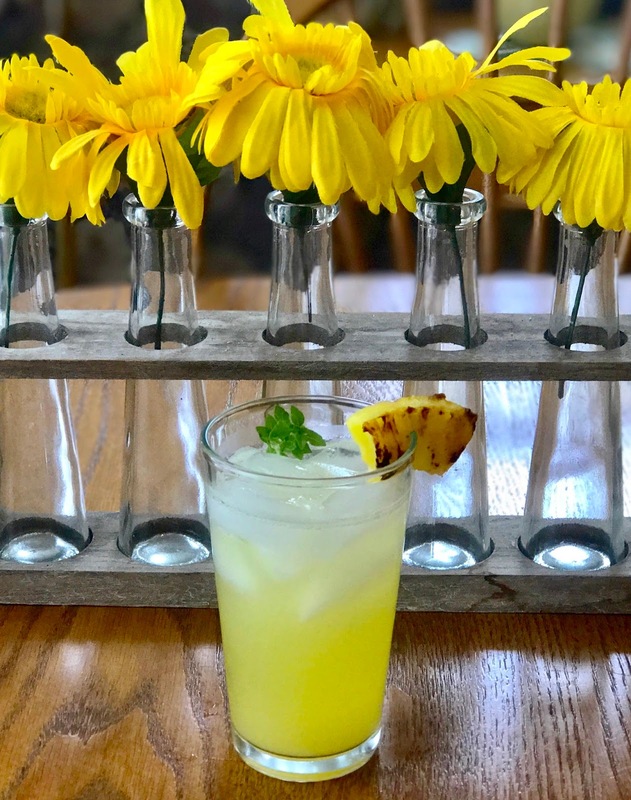 A delightful twist on lemonade. The grilled charred pineapple adds terrific flavor to this already refreshing drink! Heat a grill pan over medium-high heat. Add pineapple slices and grill 3 to 4 minutes on each side, until dark char marks appear. Remove and cool. Combine hot water and sugar in a pitcher and stir until sugar dissolves. Place the pineapple and lemon juice in a blender, and process until smooth. Pour through a fine mesh sieve/strainer into pitcher with sugar mixture. Discard solids. Serve over ice and enjoy! If you'd like a printer-friendly version of this recipe, Click Here. One of my husband's favorite things to eat. I've never made ceviche, and for some reason, I thought it would be a lot more difficult. Nothing could be easier! Now that I know that, I'll definitely be making it a lot more for him. In a blender, puree until smooth the garlic, ginger, soy sauce, and lime juice. Remove to a bowl and mix in cilantro. Slice tuna into very thin strips or very small cubes. Place tuna on a serving platter and top with a little bit of the sauce. Add a few sesame seeds and diced jalapeños and enjoy! If you'd like a printer-friendly version of this recipe, Click Here. Summer vegetables, fresh shrimp, juicy chicken and mouthwatering pineapple make these brightly colored kabobs easy to make and even easier to eat! Soak wooden skewers in water 30 minutes and then drain. In a medium sauce pan, bring 2 cups water to a boil. Add basil and stir constantly until all the leaves have wilted. Drain and pat leaves with a paper towel. Place basil, vinegar, 1/2 cup olive oil, 1 teaspoon salt, and 1/2 teaspoon pepper in a blender. Process until smooth. Preheat grill to 400 degrees. Thread chicken, shrimp, bell pepper, zucchini, tomatoes and pineapple on each skewer. Drizzle remaining 1/4 cup olive oil over skewers and sprinkle with remaining salt and pepper. Grill, turning skewers after 3 to 5 minutes, until chicken is done (the shrimp will cook a lot faster than the chicken). Transfer kabobs to a serving platter and brush evenly with basil oil. Use remaining basil oil for dipping sauce. Enjoy! If you'd like a printer-friendly version of this recipe, Click Here. A very easy-to-make dish containing a white miso dressing that adds an earthy flavor to enhance the meaty flavor of the tomatoes. By salting the tomatoes and letting them set for 20 to 30 minutes, draws out their juices so they'll meld with the dressing when you combine all the components. Definitely a favorite! Place tomatoes in a large bowl and sprinkle with salt. Let set 20 to 30 minutes. Combine oil, parsley, vinegar, mustard, soy sauce, miso, and shallots in a pint jar. Seal and shake until blended. You can also add these ingredients to a blender to combine. Add the vinaigrette dressing, corn, cheese and basil to tomatoes. Toss gently to combine, serve immediately, and most importantly, ENJOY! :) If you'd like a printer-friendly version of this recipe, Click Here. What a beautiful color this tangy turmeric brine makes for these deviled eggs! A great-tasting smooth filling, that has a touch of curry, transform regular deviled eggs into something more appetizing and interesting. Combine 2 cups water, vinegar, turmeric, and 1 teaspoon of salt in a bowl or large jar. Add eggs and chill 4 to 8 hours (or overnight). The longer you leave the eggs marinating in the brine, the more vibrant the color gets. Drain eggs and pat dry. Heat a small skillet over medium heat. Add curry powder and cumin or garam masala (which is what I used), stirring constantly until fragrant; about one minute. Cool. Cut eggs in half cross-wise and carefully remove yolks. Place yolks in a mini food processor. Cut a sliver off each rounded bottom of egg white (so eggs will sit flat). Add mayo, sour cream, mustard, and remaining 1 teaspoon salt to the food processor. Pulse until smooth. Add 1 1/2 tablespoons of the chives to the processor and pulse until combined. Divide filling evenly among egg whites and top with additional chives. Enjoy! If you'd like a printer-friendly version of this recipe, Click Here. It's all in the sauce! That's what I've heard and deem it to be true. The concentrated fruit flavor, body, and thickness from the cherry preserves and red wine make this sauce a great complement to the pork. Heat oil in a large skillet over medium-high heat. Add onions and pork and cook pork for 2 to 3 minutes on each side, while stirring onions. The pork and the onions both should have a nice sear on them. Remove pork and onions to a plate and keep warm. Add the corn and 2 teaspoons of thyme to the skillet and cook until corn has a nice char or sear (about 1 to 2 minutes). Spoon corn over pork. Turn the heat to high and add wine and salt and pepper; cook two minutes or until liquid almost evaporates, scraping pan to loosen browned bits. Add the chicken broth and cherry preserves; cook until it's reduced to about 1/2 cup (about 6 to 7 minutes), stirring occasionally. Spoon cherry mixture over pork and sprinkle with remaining teaspoon of fresh thyme. Enjoy! If you'd like a printer-friendly version of this recipe, Click Here. Preheat oven to 450 degrees. Grease a sheet pan with cooking spray. Place potatoes in a bowl and drizzle with one tablespoon olive oil, adding salt and pepper to taste. Drizzle remaining olive oil over asparagus and season to taste with salt and pepper. In a small bowl, whisk together melted butter, garlic, Italian seasoning, and lemon juice. Place salmon in the center of the pan and sprinkle with Old Bay seasoning (optional). Surround salmon with baby potatoes and asparagus. Drizzle butter mixture on top of salmon (and a little on the veggies). Place in oven and bake 20 to 25 minutes. Remove and add fresh parsley. Serve and enjoy! If you'd like a printer-friendly version of this recipe, Click Here. Turn a dish into a "creamy" meal and you'll always have my vote! 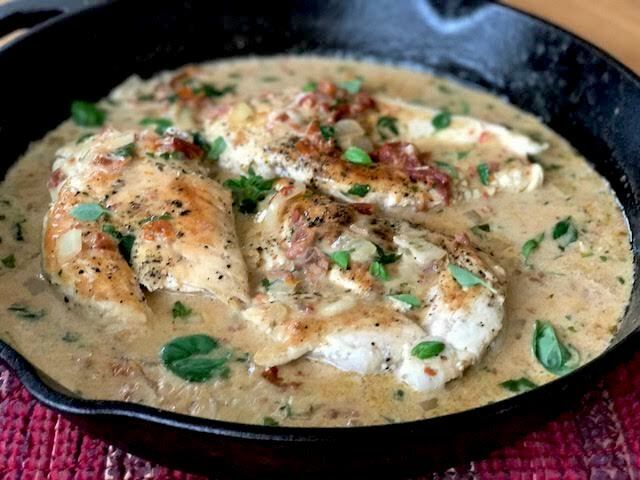 This smooth sauce with fresh herbs makes this dish taste like it came straight from a top restaurant! "Laura's Restaurant"! Place a long sheet cling wrap on top of a cutting board. Place chicken on top of plastic wrap and lay another piece of wrap over the top of the chicken. Pound chicken to an even thickness using the flat side of a meat mallet (or in my case, a cast iron skillet). Season both sides of chicken with salt and pepper. Heat 1 1/2 tablespoons of olive oil in a large skillet over medium-high heat. Add chicken and cook for about 4 to 5 minutes on each side (until chicken is cooked through). Transfer to a plate and place another plate over the chicken to keep warm. Set aside. Turn heat down to medium. Heat remaining 1 tablespoon olive oil in skillet. Add onions and sauté for a few minutes. Add garlic and sauté a minute longer. Pour in 1 1/3 cup chicken broth, while scraping bottom of skillet to release browned bits. Place sun-dried tomatoes and 1/4 cup basil in a blender and blend until tomatoes are chopped fine; or you can chop tomatoes and basil with a knife. Add mixture to the skillet and stir. In a small bowl, mix remaining 1 tablespoon of chicken broth with corn starch. Add to skillet, stirring constantly. Add cream and parmesan, stirring until cheese has melted. Remove from heat, and add chicken to the skillet mixture, spooning sauce over chicken. Garnish with more fresh basil and ENJOY! If you'd like a printer-friendly version of this recipe, Click Here. 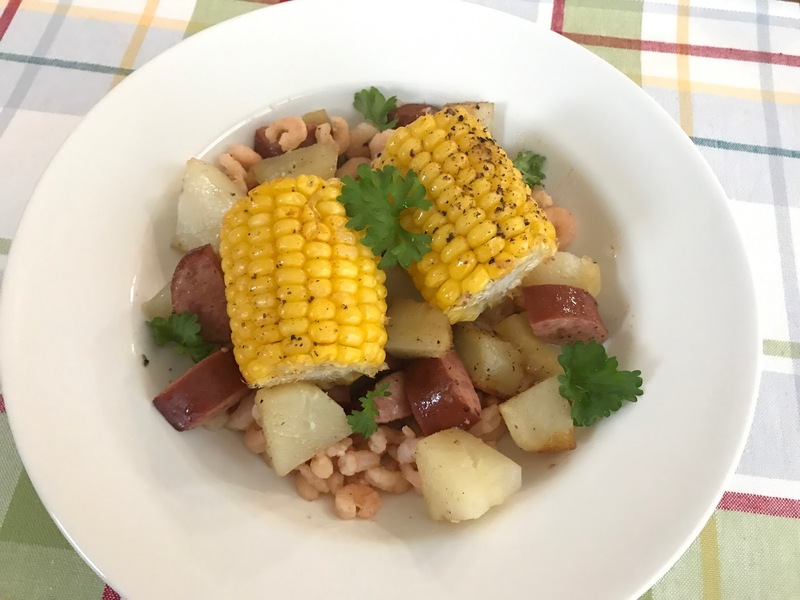 A little play on "shrimp boil", this tasty seafood dish has an incredible flavor that is magnified by the addition of smoked turkey sausage, potatoes, and a spice I cannot live without, Old Bay Seasoning! A very easy dish to make, with a preparation time that only takes a few minutes. Preheat oven to 425 degrees. Tear off 3 long sheets of aluminum foil. Spread each out on a counter and place equal amounts of the shrimp, frozen corn, potato cubes, and turkey sausage on top of foil. Drizzle each with 1 tablespoon of olive oil, and season with salt, pepper, and Old Bay. Seal foil on all 4 sides. Place on a baking sheet and place in the oven for approximately 40 minutes. Garnish with parsley. * For my shrimp, I used a 12 oz. bag of fully cooked, peeled, and deveined, salad shrimp. Instead of adding the shrimp to the foil, I tossed the shrimp in a skillet with 2 Tbs butter and Old Bay Seasoning. I added it to the rest of the ingredients after they came out of the oven.